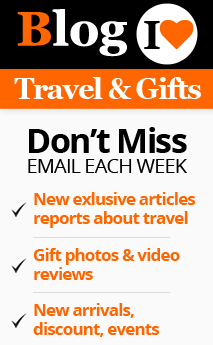 Christmas, New Year, Winter Holidays – the season of celebration is at hand. This, as you know, is the gift exchange extravaganza, if I may term it thus. 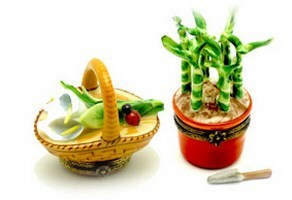 People all over the world are thinking day and night about the appropriate gifts for various people in their lives. Well? Aren’t you? The challenge here is selecting the gift that will suit the person and your relationship with him or her – your parents, spouse, children, siblings, nephews and nieces, friends….the list is long. But, you need not worry, with 1001 shops at your service. We have gift items that suit all kinds of relationships, ages and genders. All you have to do is to find time to browse through our exhaustive catalogs. 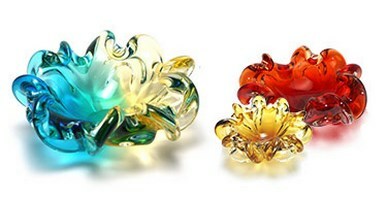 The exquisite Murano Glass articles are a lot like most relationships, beautiful with a delicate emotional element. Browse through our collections. 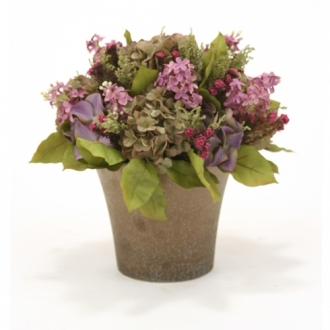 You are sure to find items that suit every temperament. Would you like to see that ecstatic look on your mother’s face when she opens the gift wrapper? 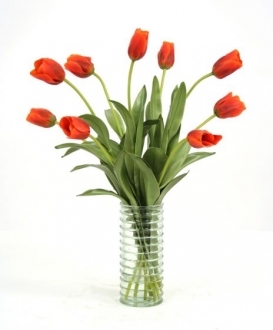 Then allow her to discover one of the most exquisitely shaped and brightly colored Murano clear glass center pieces. They are lovely crystal clear bowls that will make her proud of her dinner table. Very artistically shaped and hand painted with charming colors, these art bowls will capture any woman’s heart. She would surely like to be the proud possessor of one of those artistic wonders of Murano, be it your wife, mother or sister. So let this Christmas be an occasion to pamper your women folk with the Laguna creations. Christmas and New Year are occasions for merry making. 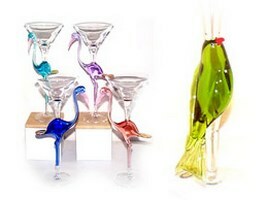 So, a set of murano martini glasses with colored stems, shaped into stork-figures will serve as suitable gifts for a special friend or relative. They will surely add to the mood of the season. Delicately structured with crystal clear glass, these articles radiate absolute merriment and help create a joyous ambience. The French Art boxes known as Limoges boxes are cute containers that can be used to hold small Christmas gifts to people whom you love, to show them that you love them. Do you plan to propose to your girl friend during this Christmas or New Year? Would you like to renew your declaration of love to your spouse during this merry season? Our Christmas & New Year collection of Limoges boxes will come in handy. 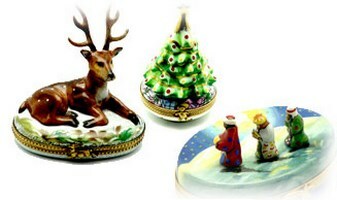 These small porcelain boxes that hold various Christmas and New Year themed figures on their lids are very suitable containers for a ring or diamond pendant. Stagger your partner with a precious piece of jewelry in one of these genuine Limoges creations. Christmas is the happiest season of the year. With New Year and a happy future in the offing, it is the best time to get engaged married. Want to be unique and stylish? 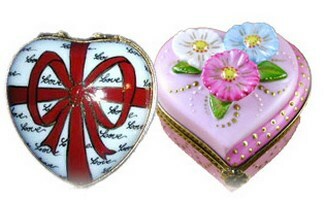 Choose one of the 1001 shops heart shaped Limoges boxes to offer the ring. Each of these boxes is crafted to show exactly how you feel about your partner. If it is your spouse that you want to impress, then again you will find a suitable container for your precious gift for him or her. 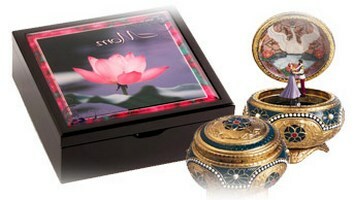 These boxes are heart shaped but the images and inscriptions on them are hand painted to express your exact feelings. 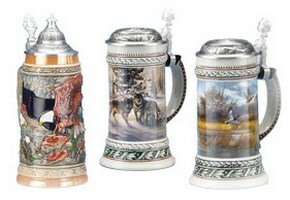 The 1001 shops.com offers a vast range of original German Beer Steins. All these steins are crafted by authentic artisans who excel in the traditional beer stein crafting techniques. Steins of all sizes and category are readily available with us. With the magnificent images of wild animals in their original habitats and other scenes associated with wild life etched on them, our wild life scene beer steins will impress anyone who loves nature and animals. If you want to add to the collectible of your wild life activist friend, you have an ample opportunity now. Go ahead and choose one of our beer steins featuring magnificently wild panorama. All these beer steins are produced by some of the most prestigious German beer companies using traditional techniques. German beer steins are fabulous collectibles. Do you have a hobbyist friend or relative? 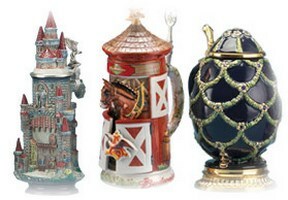 Give him or her a pleasant surprise, by gifting him or her with one of the three dimensional beer steins from 1001 shops. They are examples of excellent craftsmanship. Your friend cannot but be impressed with the minute details the artisan has used in sculpturing the beer stein to resemble various three dimensional figures. The hand crafted specimens are first rate art pieces. To gift a person with a beer horn is to transport him back in time to the marvelous Middle Ages, when drinking horns were the ceremonial drink holders. It is a really fabulous experience to drink beer from a horn. Bestow this unique experience upon your friend during this holiday season. 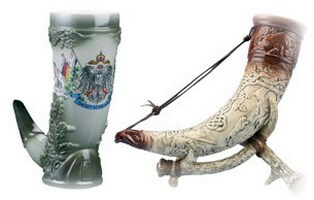 Select an artistically carved German Beer horn for your father or grandfather. They would appreciate it. We have a fantastic collection waiting for you. 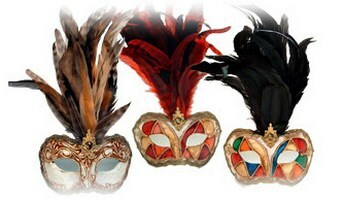 Venetian masks are world renowned for their variety and brilliant artistic creativity. The Venetian masks, originally crafted to facilitate unrestricted enjoyment, are still a part of festivities and celebrations. It allows you to liberate your spirit from social restrictions. 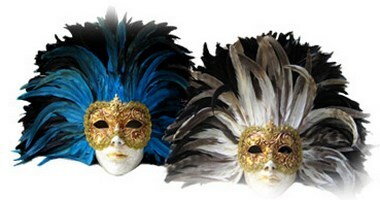 We, at 1001 shops have a large number of different varieties of these masks. They are good gift items. Decorated with a lush bunch of colored feathers, these half masks are highly prized. New Year is a season for carnivals and masquerades. Enable someone you love to enjoy special looks by wearing one of our galletto masks. The beautiful crown of feathers and tastefully painted half face will capture any lady’s fancy and the masked lady will capture the fancy of many a man. This feathered and richly decorated full face mask is a real winner. Empower your lady to shine in this year’s New Year party by gifting her with a full face feather mask. The golden upper face of the mask will frame the lady’s eyes to enhance their allure. Let your lady wear the mask and allow yourself to fall in love with her eyes all over again. It will be an exotic experience. The animal masks are great fun. If you have a friend or relative with a funny bent of mind, he will surely love one of these. 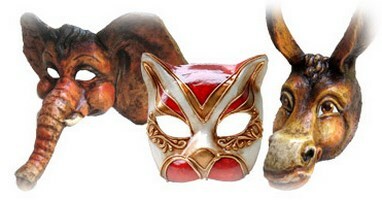 Gift him with an animal Venetian mask and allow him to enjoy the attention he gets in the party. These are full face masks that allow anonymity to the wearer. Young people will appreciate this very much. Music boxes are actually jewelry boxes. But one can always keep anything precious in them. It is a pleasure to open the box to look at the things you hold dear with the accompaniment of soft music. Gift the people you hold dear with the choicest music boxes from 1001shops. It is always a challenge to choose a gift for your toddler. He or she will have all sorts of toys available in the market. So, how to surprise him or her this season? Children love surprises. 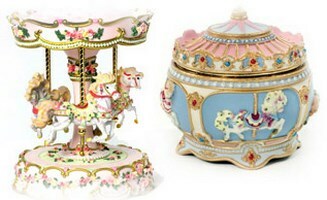 Gift wrap a carrousel music box and leave it on his or her bed –side table. To see the child’s face lit up is a treat in itself for you. 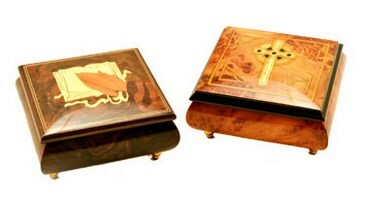 These are jewelry boxes that are highly romantic in appearance. Gift her with a ring or pendant in this music box. Alternatively gift him a pair of cuff-links or a tie-pin in it. The gift will be revealed to the recipient with the accompaniment of a piece of romantic music. Imagine the ecstasy that it will bring to your partner! When it comes to choosing a gift for your relatives or acquaintances who are advanced in age, it always poses problems. But we have a perfect solution for you. 1001shops feature a large variety of Christian music boxes . These are small boxes in which a person can keep some precious souvenirs or jewelry. Your aged relative will like the religious symbols and images on the box. They will find it extremely pleasant when they open the box that produces soothing tunes. If you make use of some of these ideas, you can be assured that this holiday season will go most agreeably.